“First Comes White — Then White with Color;” page 25 of a two-page article in Delineator, July 1931. Butterick coat pattern 3964 was a double-breasted polo coat with raglan sleeves. Delineator, July 1931, page 25. It was described as a polo coat, and camel’s hair twill was suggested, although pale beige or pastels could be substituted for natural camel color. 1931 is not far from the late 1920’s, so it’s not surprising to see a lot of nineteen twenties’ hipline interest combined with a nineteen thirties’ natural waist. This summer dress, Butterick 3949, combines white with color. I thought the tennis racket just signalled “summer,” but she’s wearing athletic shoes, too. Delineator, July 1931, page 24. The “white for tennis” idea didn’t apply to casual games. Butterick 3979 has an unusually long, curved yoke on the skirt front. Delineator, July 1931, page 24. This skirt was only pleated and yoked in front; the entire back of the dress is one piece. This dress has a clever horizontal line (yoke and short sleeves) making the upper body look wider, in contrast to narrow 1930’s hips, accented with strong vertical lines in the skirt. The curving seams on Butterick 3993 give it a dressy look to me, and in spite of the tennis racket, she is wearing pumps, not tennis shoes. Delineator, July 1931, page 24. The elaborate cut of this skirt is repeated in back. “It is the perfect frock either for playing or spectating;” I think silk shantung would be a “spectating” fabric. Butterick 3999 is sleeveless, double-breasted and loosely bloused. Delineator, July 1931, page 24. The back view shows short sleeves. On this dress, the flares of the six gored skirt are repeated in the back. 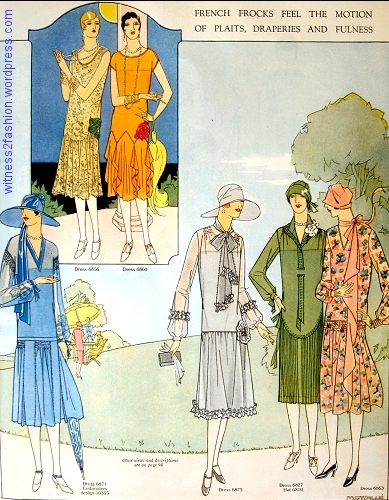 Financial constraints during the Depression made Delineator magazine switch to smaller and less elaborate illustrations than the glorious full color fashion pages of the mid-1920’s. Butterick 3956 has a 1920-ish look, with its long “weskit” style bodice and yoke, but it is from Delineator, July 1931, page 25. Optional short sleeves. “…For any sporting event — for action or the sidelines. It’s all-whiteness fairly cries for the addition of the boldly bright accessories that will ring changes in the simplest little outfit this year.” Transforming a dress with accessories was a frequent theme in the Thirties. Butterick 3995 has a surplice-line wrapped front. Delineator, July 1931, page 25. There is a long sleeved version, too. A vestee (a partial blouse) is usually separate from the dress, and the colored cuffs might be detachable for laundering. All of these patterns were available in what was then the normal range of sizes for women: bust 32 to 44 inches, with hips correspondingly bigger. Butterick 3954 shows some vestiges of 1920’s styles. Delineator, July 1931, page 25. Butterick 3973, a simple “utility” dress, accessorized with a golf club. Delineator, July 1931, page 25. Optional short sleeves. It’s undeniable that white accents a summer suntan (chic in 1931) and looks cool and fresh on hot days.